The purpose of this competition is to find the best live laser jockey at the annual ILDA Conference. Entrants must be current ILDA Members at the time of the competition. Entrants either must be registered for the full ILDA Conference, or must have paid the attendance fee for the Lase-Off/Laser Jockey event. The event will take place as part of the Lase-Off evening. During the Lase-Off, each Laser Jockey entrant will perform for a maximum of 3 minutes, to music provided by ILDA. This will be music "with a beat" such as techno. The music will be selected from more obscure or lesser-known songs. The entrant will not know the music selection in advance. All persons in the room who have paid to attend (as full Conference registrants or for the Lase-Off/Laser Jockey event) are eligible to vote, except for the entrants. ILDA will provide a voting form. For each performance, voters will give a single numeric score from 0 to 5 points. It is up to each voter as to what this score represents (artistry, creativity, musicality, overall impact, etc.). After the performances are completed, the voting forms are collected. For each performance, the points are totaled. The entrants with the top three point totals are awarded First, Second and Third Place. In case of a tie, a coin will be flipped to determine placement. This is because the trophies are already manufactured prior to the Conference; the only engraving is for First, Second and Third Place. The only connection with the music is via the room's sound system. Entrants will NOT have an audio feed. They can use their own microphone to pick up the room sound. For beams/atmospherics, the X-axis will be at 100% and the Y-axis will be at approximately 60% due to ceiling height restrictions. Both graphics projectors are centered on the stage. There will be no effects, other than scanner-produced beams, atmospherics and graphics, allowed during the performance, even if available on the projector. This means no DMX- or MIDI-controlled lumia, gratings or other effects. This is to keep the competition focused on scanner beams & graphics. For 2018, entrants must contact us as soon as possible to let us know you are entering. Also, tell us which software platform you will be using and whether you are bringing your own ILDA output interfaces. As of September 20 we have five DSP's (if you need more, let us know as soon as possible) and a Pangolin Beyond computer setup. You can bring your own computer and your own software platform with ILDA Digital Network output or up to 9 ILDA DB-25 outputs. These should be arranged/discussed at least two weeks prior to the Laser Jockey event. 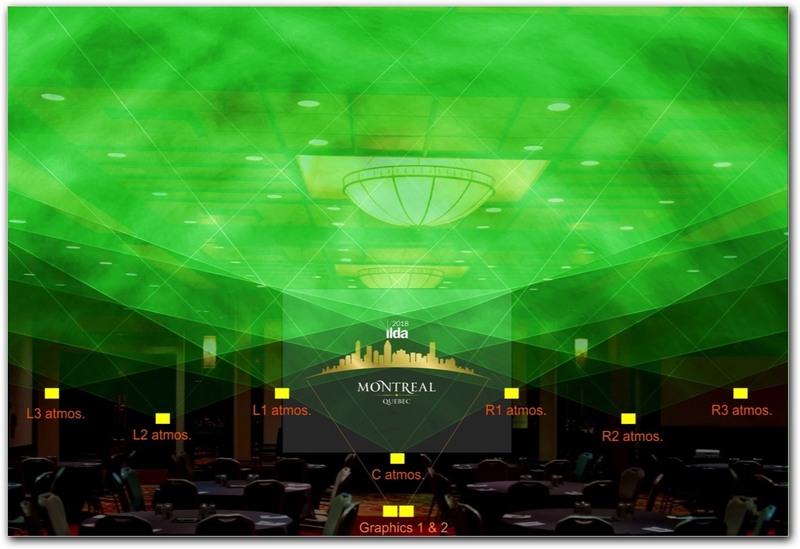 For the Montréal conference, there will not be audience scanning. All beams will be set over head level, or to where a person could not stand or reach. Any systems with "projection zones", "image masking" or similar software-controlled beam power reduction can be adjusted during the setup time, prior to the Lase-Off. A reasonable time, no more than 5 minutes, will be allowed for this. All persons using audience scanning during the Lase-Off will be required to certify to ILDA and to the host company that their scanned effects take into account audience safety; for example, no tunnels collapsing into a full-power beam. Further, they will not override safety features such as projection zones or safety lenses and thus increase beam power over the previously-set limits. The entrants' equipment will be set up prior to the Lase-Off. ILDA will provide information onsite as to the timing of the setup and any rehearsal. Each entrant has 15 minutes for setup and testing. This normally happens in the afternoon, on the day of the Lase-Off. If they cannot set up in this time -- and this includes any laser safety settings such as projector zones -- then they will be disqualified. To register as an entrant for this event, click the button below to go to the ILDA event registration page. As stated above, entrants must be current ILDA Members, and must have registered either for the Full Conference or for the Lase-Off/Laser Jockey event. The order of the entrants' performance shall be determined by the Lase-Off technical director, based primarily on ease of switching between equipment, and then by randomization. For example, if three entrants are using the same equipment, these three should be grouped together to minimize switchover time. The position of the three in the overall order would then be randomized. There is a time limit of four minutes between entrants, to allow for changing over and setting up from one entrant to the next. If any entrant goes over the 4-minute limit due to equipment or any other problems, then they are scratched and the next entrant can begin setting up. In case of any problems, ILDA has the final say over whether an entrant will be able to perform. While ILDA will make its best efforts to accommodate all entrants, ILDA will not be responsible if there are technical, safety or other problems impeding or preventing a performance. Entrants should note that currently the Lase-Off and Laser Jockey competition are informal events, primarily for fun and social interaction (notwithstanding the fact that winners also receive official ILDA Award trophies). There is a maximum of twelve entrants. This is so that the event does not exceed more than about an hour. If more than twelve persons enter, first priority is given to persons who paid for full Conference registration, based on the date of their registration payment (preference given to the earliest-paying registrants). This is then followed by persons who paid only for the Lase-Off/Laser Jockey event, again based on the date of their event registration payment. Any entrant limitation shall be determined by the Executive Director based on his or her registration records. The scores that voters give to the competitors are NOT multiplied by their ILDA membership category number of votes. First, Second and Third Place trophies will be manufactured prior to the ILDA Conference; the trophies will not have the winners' names engraved. The Laser Jockey winners' names will be listed along with other ILDA Artistic Award winners, and the Laser Jockey award counts as a standard ILDA Artistic Award.